Here's another fun motorcycle-related ad that I've found. 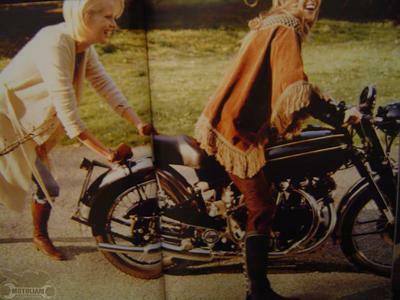 This is in a large print catalogue for Tommy Hilfiger. I found it at a mall in Lisbon and the helpful girls at the store gave me the whole book. It's quite large, about 16"x24" closed. I was excited to see this bike. . . . . because it's very special. some sort of HRD or Vincent?